There is an impressive, slightly faded Victorian building within Tesco’s car park in Lewisham; it looks rather out of place amidst the 21st century internal combustion engines and 1980s retail architecture. 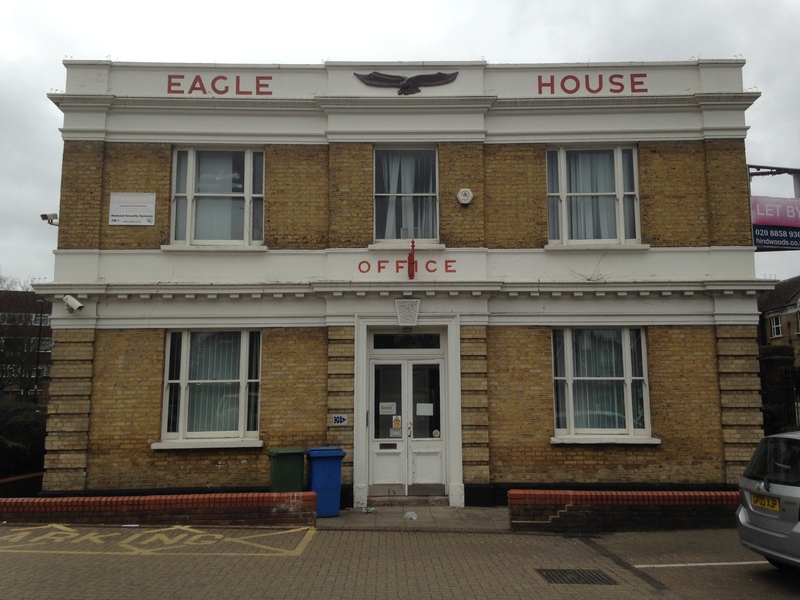 It is Eagle House which was the former office of H & V Nicholl’s Anchor Brewery and was built around 1870. The Lewisham brewery seems to date from the late 18th century, initially on Lewisham High Street (1); its owner, Abraham Constable was mentioned as an ‘eminent Lewisham Brewer’ who lived at Bridge House Farm in Ladywell by 1804 (2). While there appears to be no online reference of it this, Constable seems to have been in partnership with someone called Fordham. The usually reliable Edith’s Streets has brewing on the Tesco site from 1818, presumably with Constable and Fordham. Abraham Constable was Deputy Lieutenant of the County of Kent and lived at the rather grand Mount Pleasant in Hither Green which was built for him in 1810. Abraham Constable had an interest in the White Hart at Lee Bridge (bottom of Belmont Hill) as late as 1830. But ownership of the Lewisham Brewery had been sold to Fordham and Marsden by 1820 (3), possibly earlier as they were in partnership from as early as 1810, in relationship to a land deal next to The George. Constable died in late 1832. The brewery was again sold in 1827 as there was a letter from a B Wood, who was ‘partner in recently sold Lewisham Brewery’ to John Courage offering Courage the Roebuck pub in September 1827. It isn’t clear whether Wood was the current or recently past partner. The John Courage referred to in 1827 would probably have been the son of the original brewer from Aberdeen. John Courage (senior) had bought an existing brewery in Horsleydown, Bermondsey in in 1787 but died in 1797 aged just 36. His son John was born in 1788 and became a partner in 1811. It doesn’t appear that the letter relates to anything more than The Roebuck though, although at some point the name changed from Lewisham Brewery to Anchor – a name shared with the Courage Brewery at Horsleydown, Bermondsey as well as that ofthe eponymous brewery on the South Bank – once partially owned by a tenant of Lee Manor House, Frederick Perkins. The location is shown on the Ordnance Survey map below surveyed in 1867. There is nothing on-line suggesting connections with other breweries so maybe the earlier date is correct – certainly, as will be seen below, there were connections with Lewisham from around that era. They could of course been brewery managers who then became owners (as we saw with the Barclay Perkins brewery). The Nicholl brothers were from the Chipping Barnet area, perhaps a century before suburbia encroached upon it. Harry was born in 1810, possibly a twin – there was a sister of the same age in the 1841 census. He was still living at home in 1841 – with Vincent and two sisters. It was a family of wealth – there were eight servants living at the family home – Greenhill Grove. The family wealth that allowed the brothers to buy to brewery came, in part, at least, from slavery – their father, Richard who died in 1839, owned two estates in St Vincent with 163 and 216 slaves in 1837.. They had two brothers who had already left home by the time the census enumerators called for the first time at Greenhill Grove in 1841 – J R Nicholl, who was to become Rural Dean of Streatham – a role he stayed in until he was 95! Another brother, Charrington Nicholl, had moved to Essex and took over the East Hill Brewery in Colchester (4) which lasted until about 1925, when it was acquired by Ind Coope. There is a link to the East End brewers Charringtons – the name for which comes from a John Charrington. He was the father of the Vincent and Harry Nicholl’s mother, Anne. By 1851 Harry had moved to Beckenham and was living on his own (with three servants), a decade later he was still there but he married Emily in 1867 in a church on the Strand, she was from the then market town of Watford. By 1871 census showed them still in Beckenham and they had an 8 year old daughter plus two children from Emily’s previous marriage along with a trio of servants. A decade later, he was living at Morants Court in Chevening in Kent, this is a large country house – he seems to have rented rather than purchased it, but times were not hard – they had five servants living-in on census day. They may well have moved back towards London – he died in 1889 in Bromley – certainly his widow was living in Beckenham in 1891. Vincent was born in 1814, like his brother he seems to have remained in and around Barnet until at least 1841. He married Lousia in Lewisham in 1843. With both the next two censuses he was away from home, in 1851 visiting a wine merchant in Lewisham, and in 1861 he was in a large boarding house in Brighton. It was probably a relatively upmarket hotel, the other clientele included a Navy Commander, a Norfolk vicar and a Barrister. It appears that they had no surviving children Vincent and Louisa were listed in the 1871 as living in Reigate Foreign (originally outside the castle walls) with five servants – a compliment that had increased to seven a decade later. He died after the sale to Whitbread in 1902, still living in Reigate. The brewery was sold to Whitbread in 1890, perhaps precipitated by Harry’s death the year before, for what seems like the incredibly large amount of £185,000. In employment terms it had grown considerably from the ’11 men’ in 1851 – the 1881 census put the workforce at 30. Whitbread’s motive for the purchase seems to have been to turn the plant into a bottling depot for their operations south of the Thames. 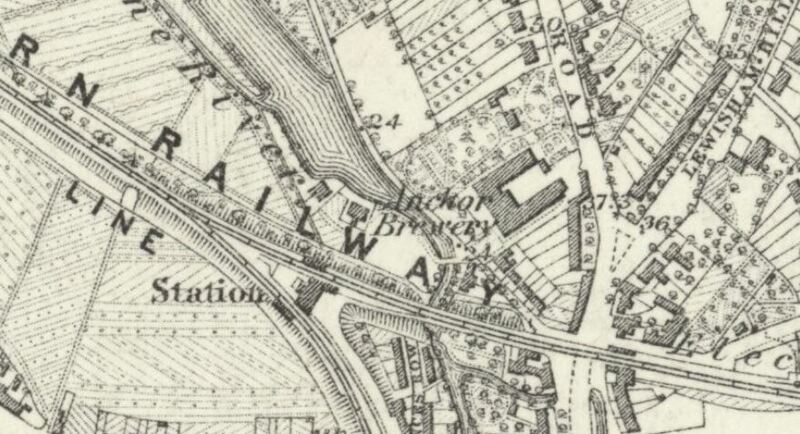 Although they were also to take on Anchor’s tied trade that amounted to 24,000 barrels a year – it is known that they supplied at least two Lewisham pubs – The Roebuck (covered in Running Past) and the White Hart, along with Eltham’s Rising Sun, Forest Hill’s Railway Telegraph and Beckenham’s Greyhound amongst many others. 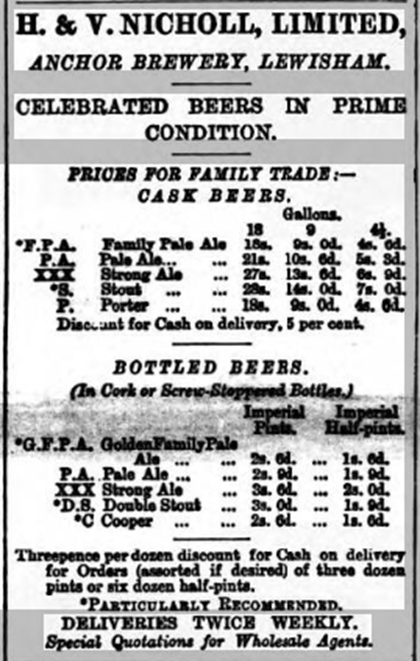 The brewery did more general sales to the trade and private customers as this advert from the Kentish Mercury which appeared in various guises during the 1880s and 1890s shows (5). The photo above is from just after World War 2 it shows the bottling plant from the air – it is on the right hand side of the picture about half way up. 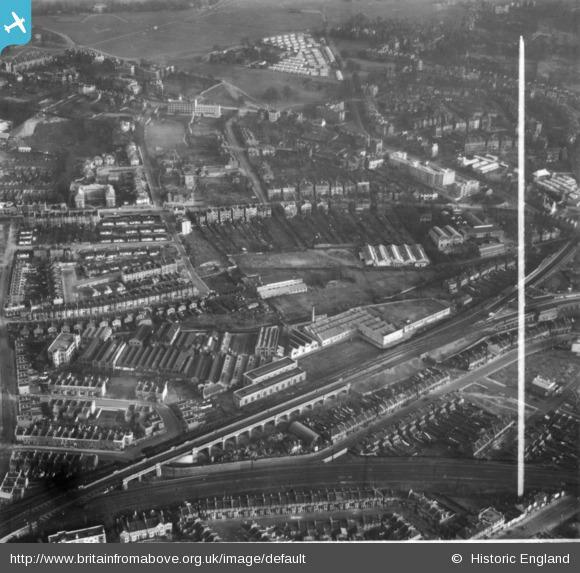 Just above it is the then very new Lewisham Hill Estate, and a little further up are the prefabs next to Hollyhedge House are clear – there is a photo from a different angle from an earlier post. Just below the bottling plant is the engineering firm Elliot Brothers (which the blog will probably return to). The bottling plant continued in operation until the 1980s when it was sold to Tesco for the current supermarket. The bottles below may have been used at Lewisham during Whitbread’s ownership. The Anchor name does live on close to the site, what the brewery tap is on the corner of Lewisham Road and Lewisham Hill (known for a while as Bridge House). It closed for a while in the early 2000s but re-opened in 2011 and was still open when this post was updated (June 2018). 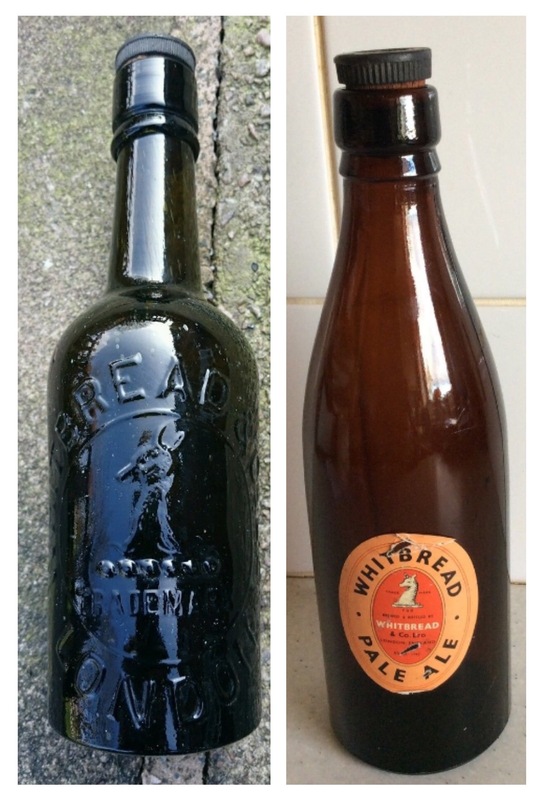 The black and white photo is from the Britain from Above website which allows use of its photos for non-commercial blogs; bottle photos come from eBay. The photo of The Anchor is by Chris Whippet and is on a Creative Commons via Geograph. The census and related information comes from Find My Past. 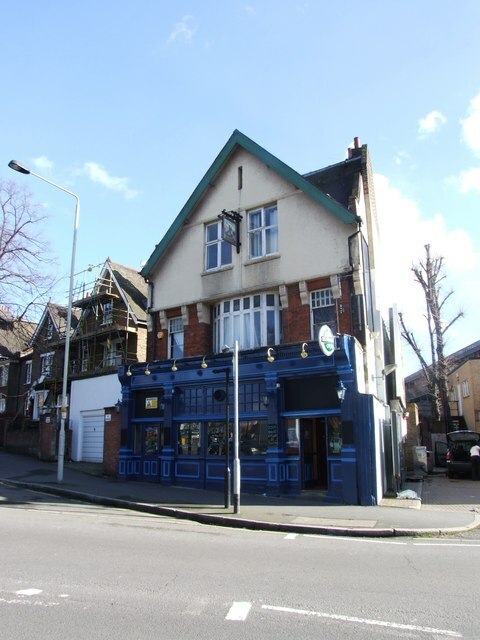 This entry was posted in Lewisham History and tagged Anchor Brewery, Charringtons, Eagle House, H & V Nicholl, Harry Nicholl, John Courage, Lewisham Brewery, slavery, Vincent Nicholl, Whitbread on March 23, 2016 by Paul B. Thank you so much for this entry The lewisham Anchor Brewery was owned by my uncles Harry and Vincent Nicholl.My Great Great Grandfather Charrington Nicholl had a brewery in East hill Colchester! All realated any more info please! Thank you regards Michael Charrington nicholl. Thank you for the kind comments! Sadly, I am afraid that this is all that I know at the moment. I have access to a couple more on-line newspaper databases since I wrote the post and was planning to ‘revisit’ it at some stage on 2018. If I find out anything else then I’ll try to remember to let you know.